listing file. It also allows the user to run the FALCON-A Simulator. assembler using its exception handling mechanism. instruction opcodes, register opcodes and constants using the symbol table. contents as the instructions execute. 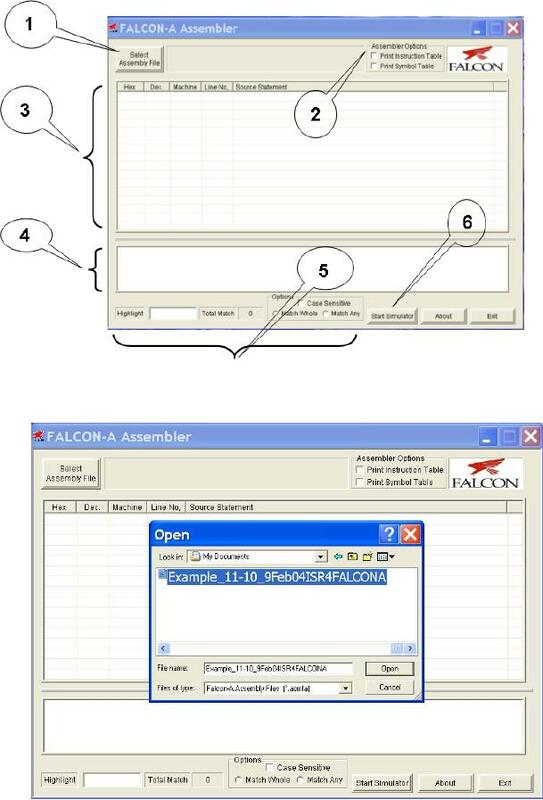 Assembler Options: Labeled as "2" in Figure 1.
addresses and labels with their respective values. with an extension of (.lstfa). total number of matches found. 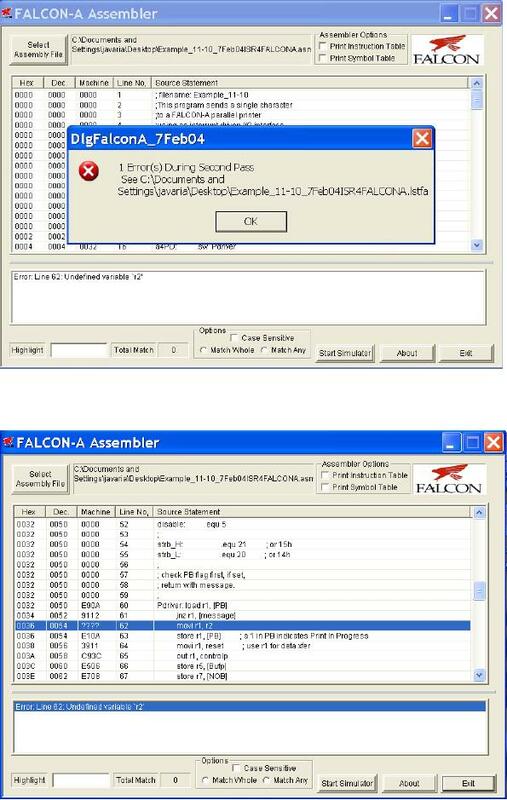 Simulator is run using the FALCON-A Assembler's Start Simulator option. values present in different registers before during and after execution. Transfer Language, the op-code and the instruction type. before, during and after program execution. Search: The search option for the FALCON-A simulator is labeled as "17"
labeled as "18" in Figure 6. Change PC option (explained below). instruction to which the specified PC points. change the value present in a particular register. present at a particular memory location. user indicates the input type and source. features displays the I/O ports stating from the index specified. .binfa will be generated by FALSIM. also be assigned to variables when they are defined. and jump tables can also be set up in the memory using this directive. same name. Every label should have a colon (:) after it. at a particular address in the memory. of the first instruction in the ISR at this location. Address 4 to 125 can be used for addresses of data and pointers1. FALSIM will generate an error at the jump [first] instruction. procedures. Each procedure should be terminated with a ret instruction. terminated with the iret instruction. The last line in the source file should be the .end directive. .org directive in the source file. store instructions. Recall that the displacement field is just 5 bits in the instruction word. instruction must fit an 8-bit field in the instruction word. 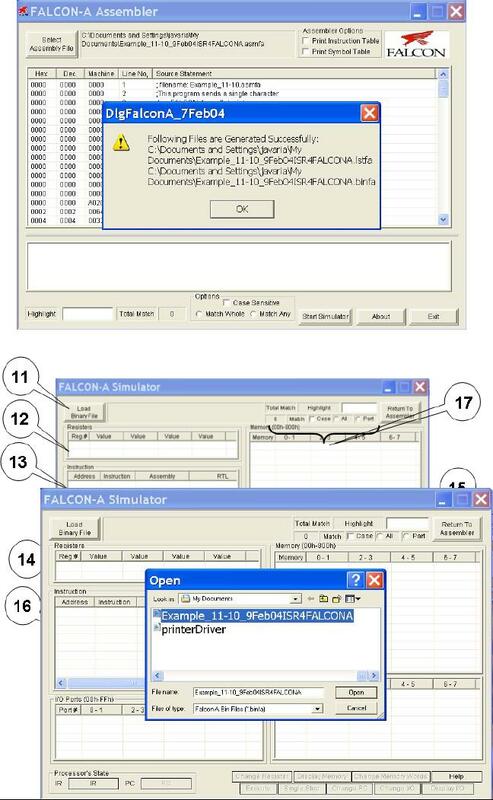 as shown in the Figure 1.
the dialog box as shown in the Figure 2.
binary (executable) file will be generated with an extension .binfa. separate panes, as shown in Figure 3. "6". This will open the dialog box shown in Figure 6.
locations contain constants defined in the program. program (i.e., the value of main). address of the printer driver in r6 from the pointer area in the memory. this value is brought from memory location 000E into register r1. 0046h. The nop instruction is used here as a place holder. 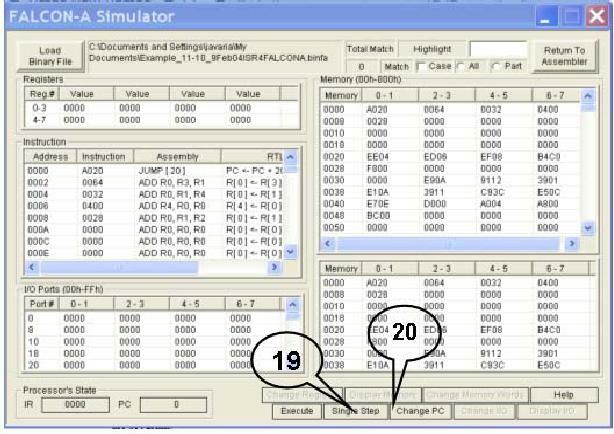 instruction executes, the value in r4 (i.e., 28h) is brought into the PC. program, this is the halt instruction. · Click single step again to enter the printer driver again. instruction. This is mivi r1, 1 at address 0036h. 3Ch (60 decimal) when the out r1, controlp instruction executes. in different panes of the simulation window at each step. before the ISR change them. till the in r1, statusp instruction is ready for execution. value in r1 should be 0080. FFFF3 instruction, which stores an error code of ­1 in r1. extension. The result will be the same in both cases. sequence should be used to overcome this limitation of the FALCON-A. made possible by the .sw directive. The value of a should be less than 15.
and jump) instructions for large values of the target address. instructions bring a 201 in register r1. multiplier or divisor is a power of 2.